Fruit set in kiwifruit is strongly dependent on pollination, which is limited by the lack of efficient male pollen donors, among other factors. We searched for molecular markers that could be polymorphic in relation to flowering time in order to classify male kiwifruit plants to discard those that are not likely to perform as efficient pollen donors. 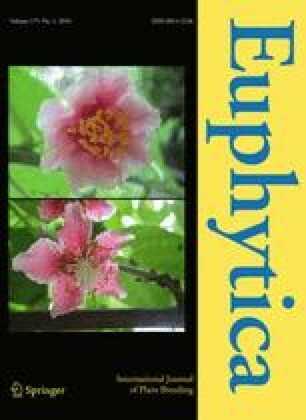 Random amplified polymorphic DNA (RAPD) and modified amplified fragment length polymorphism (AFLP) markers were generated using 41 male kiwifruit plants in two flowering groups, early- and late-flowering males (with respect to the female cultivar ‘Hayward’). One RAPD and nine modified-AFLP markers polymorphic between male plants exhibiting different flowering time were identified, sequenced and analysed in databases. Unweighted pair group method with arithmetic average (UPGMA) clustering and multidimensional scaling showed that these markers could be used to classify the male plants into flowering groups. Analysis of molecular variance (AMOVA) agreed with this classification, showing that most of the genetic variation is found between flowering groups. Sequence analysis based on a database search revealed that the polymorphism PolM contains a 7-nucleotide long element involved in the repression of the phytochrome A gene, that Pol4 is a partial sequence of a phytochrome B gene, and that sequences Pol3, Pol5, Pol7, and Pol9 show high identity with ESTs from kiwifruit buds treated with hydrogen cyanamide. Clustering analysis supported the previous classification of males into flowering groups, making it feasible to predict male plants’ flowering times with respect to the cultivar ‘Hayward’ based upon these molecular markers. Marina Novo and Silvia Romo contributed equally to this work. This is a contribution of the Interuniversity Research Group in Biotechnology and Reproductive Biology of Woody Plants. This research was supported by the Xunta de Galicia (Regional Government of Galicia, project PGIDIT04RAG291002PR). We thank SERIDA (Regional Government of the Principado de Asturias) and Kiwi Atlantico S.A. for providing the plant material, Drs. E. Labrador and B. Dopico (Univ. Salamanca, Spain) for letting us use their laboratory facilities, and Verónica López for her technical assistance. We also wish to thank Dr. Pablo Presa (Univ. Vigo, Spain) for his help with the AMOVA analysis.